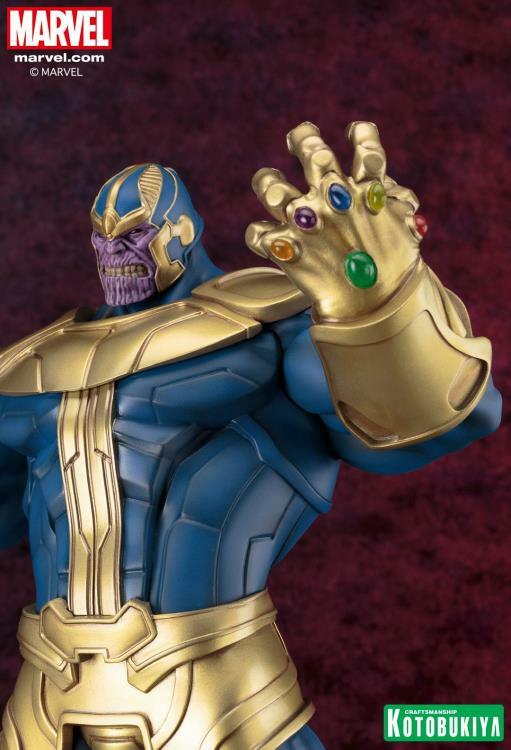 While the last series of Marvel Universe Fine Art Statues from Kotobukiya focused on the heroes and villains of the X-Men, the next character comes from outer space and has plans to rule the entire universe: THANOS! Known as the “Mad Titan,” Thanos is a massively powerful alien who first appeared in the pages of Marvel Comics back in 1973 and has been a menace ever since. An Eternal and Deviant as well as a brilliant scientist, the purple villain became obsessed with Mistress Death and sought to please her by killing. Over the years Thanos would use various weapons and tools in his quest for Death, but by far the most famous and destructive is of course the Infinity Gauntlet, an all-powerful relic combining the powers of six Infinity Gems. 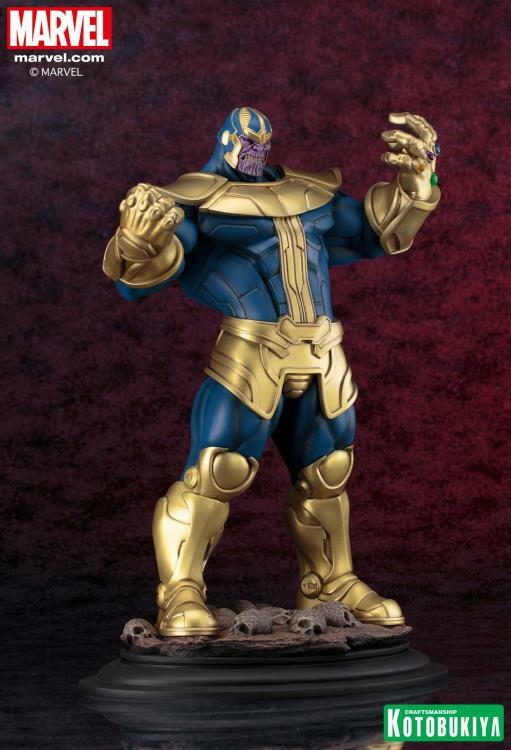 With his popularity reaching new heights thanks to his appearance in the Marvel Cinematic Universe, Thanos is the perfect new addition to the Fine Art Statue lineup. 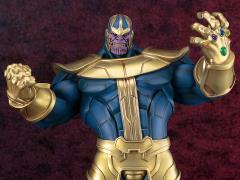 Always willing to get his hands dirty to further his own schemes, Thanos has arrived to unleash untold destruction on any who would stand in his way! The Mad Titan stands invincible on the battlefield, reveling in his own might as he sweeps away his foes with a clenched fist and the power of the Infinity Gauntlet. 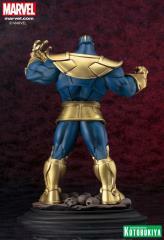 His massive frame is garbed in his iconic blue and gold costume, a segmented and reinforced bodysuit with armor plating, huge gloves and boots, a protective skirt, and a wide collar. 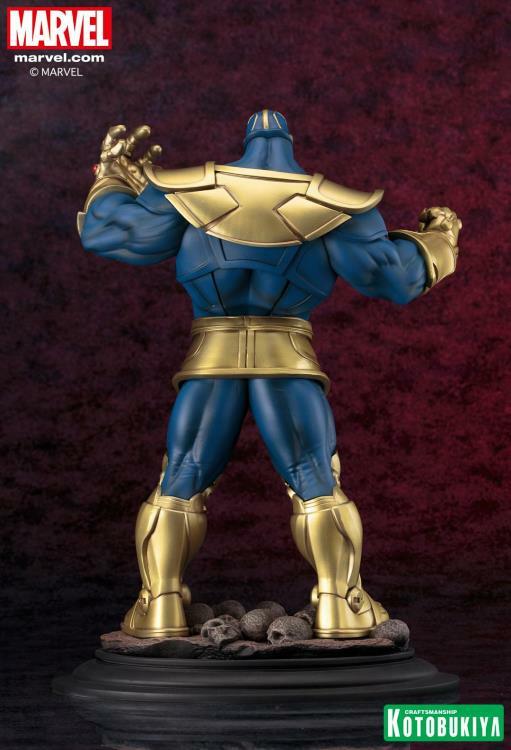 All of that adds bulk to his already huge physique, and the amazing sculpt shows off both his musculature and the intricate details of his suit. And while Thanos’ fist may seem intimidating, it’s really his left hand that’s the most dangerous for it bears the Gauntlet, expertly recreated with the six differently-colored Gems. 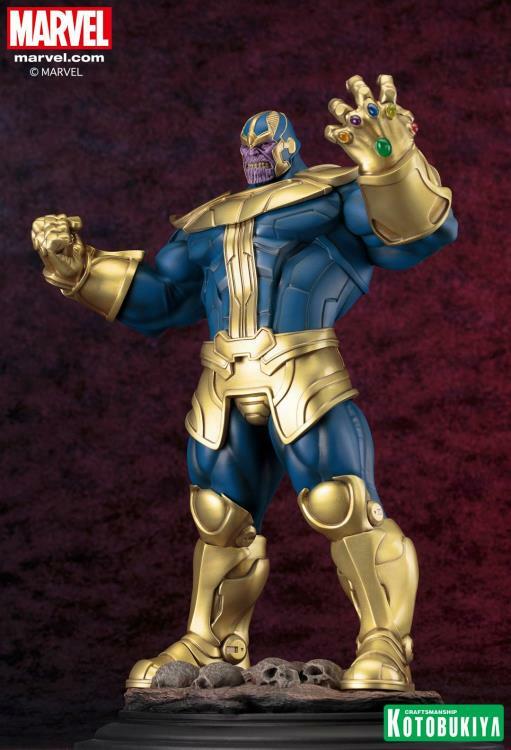 The only uncovered part of Thanos is his face, and you have two great options for your display: the Mad Titan giving a sly smile or baring his teeth in a fearsome grimace! 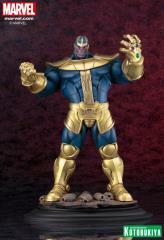 Thanos stands an incredible 15 ½ inches tall in 1/6 scale as he poses on the skulls of his defeated enemies. 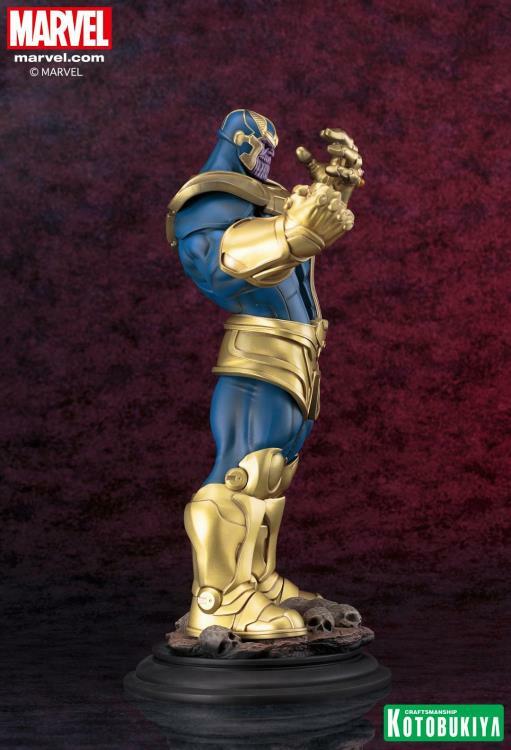 Guaranteed to make a big impact in your collection, this Fine Art Statue is the quintessential collectible of the iconic Marvel villain.